Off once again on our annual highpointing pilgrimage, this time through the mid-Atlantic states. As usual, we left St. Louis after work on Friday. We drove as far as Louisville and settled down for the night. 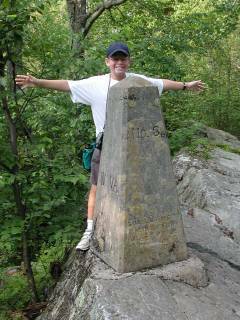 Saturday, we headed southeast from Louisville toward Black Mountain, the Kentucky highpoint. 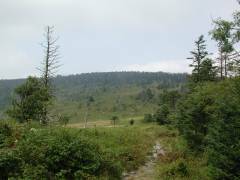 It is in an area honeycombed with coal mines, and the Penn-Virginia Coal Company, which owns the land with the highpoint, requires you to sign and file a release, just in case the mountain crumbles to dust under your feet while you are there. Finding Black Mountain is not terribly difficult, but the turnoff is a bit obscure. Coming southeast along state route 160, you have to turn sharply right just before you crest the ridge which separates Kentucky and Virginia. We went 100 yards past, but found a convenient gravel parking lot in which to turn around. 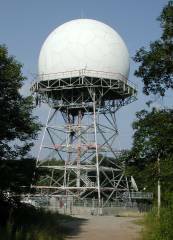 From there, it is about a mile-and-a-half to the FAA long-range radar facility, and another quarter of a mile to the highpoint. According to my GPS, the Kentucky highpoint is found at 36deg 54.855' N, 82deg 53.648' W.
No sooner had we driven out of Asheville, NC, and headed up the Blue Ridge Parkway than we ran into increasing cloud cover over the Parkway. We had to slow to a crawl, taking at least twice as long as we had counted on to drive up to the Mt. Mitchell turnoff. After what seemed an interminable trip feeling our way along the Parkway, we arrived safely at the Mt. Mitchell state park and drove up to the summit parking lot. 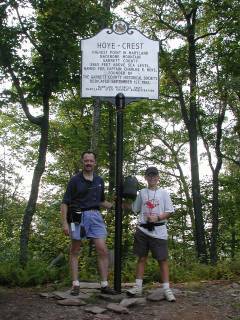 From there, it is a short stroll to the observation tower, sign, and USGS benchmark which mark the North Carolina highpoint at 35deg 45.881' N, 82deg 15.914' W.
The benchmark is set into the rocks where Nathan and I are standing in the photo above. Needless to say, the "view" from the top of the observation tower was less than spectacular on this particular day. Steve Eckert had better weather. 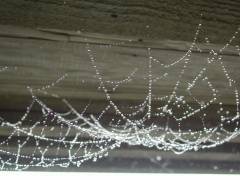 As we ate lunch at the park restaurant, we noticed the spider webs hanging from the overhang above the windows festooned with pearls of cloud condensation. Since the clouds gave no hint of parting, we bailed out from our plan of driving up the Blue Ridge Parkway into Virginia and opted for the lower-altitude interstate highway. We drove up to my cousin's house in Radford, VA, for the night. The trail then meanders up through an alpine landscape more reminiscent of the Sierra than most of the eastern U.S., with rocky outcrops and scrub vegetation. 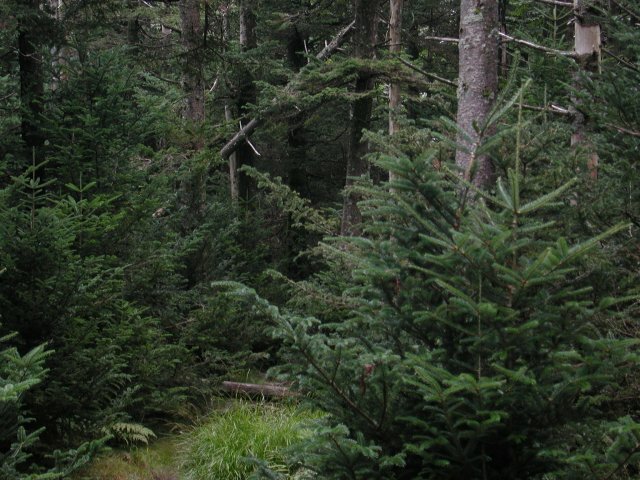 It would be a great springtime hike when the rhododendron are blooming, but we had to content ourselves with the green of their leaves and of the scrubby spruce which dot the landscape. We paused for lunch at a shelter along the stretch of the Mt. Rogers trail which uses the Appalachian Trail. From there, we could see our goal for the afternoon about a mile distant. A short distance along, the summit trail branches off to the right and meanders up the gentle slopes to the top of Mt. Rogers, proper. Looking north from the Adirondack shelter, Mt. Rogers is the ridge in this shot, every bit as unimposing as it appears. 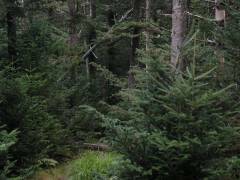 Its cover varies from brush to modest spruce forests, and its slopes are quite gentle up to its 5,729' summit. Another couple arrived on top of Mt. Rogers moments after we did, so we shared picture-taking duties so LouDon, Nathan, and I are all pictured. 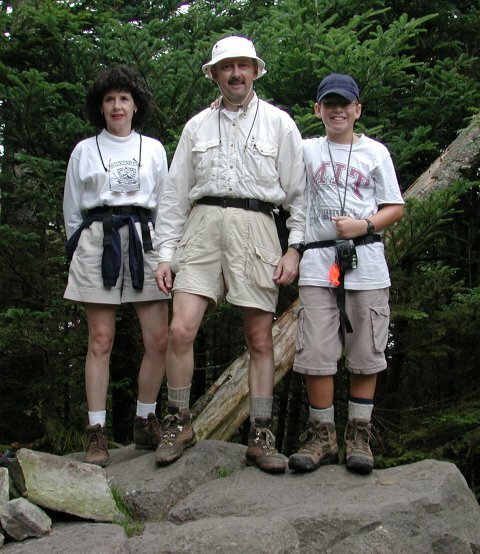 (No cracks about who got the good looks in the family, please!) 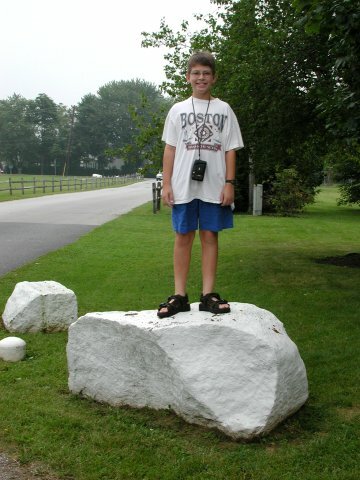 The benchmark is located in the rocks just to the right of Nathan's feet at 36deg 39.599' N, 81deg 32.701' W.
There is a method to our madness of having Nathan wear an MIT t-shirt on this particular hike. 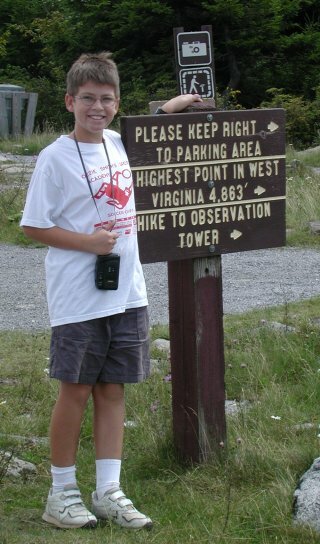 When I was researching the highpoints for this trip, I found that Mt. Rogers was named after a "William Barton Rogers." Being an MIT alumnus myself, that was a very familiar name, and a little further research proved that William Barton Rogers had been a geographer in Virginia in the first half of the 19th century. His wife was from Boston, and he was contacted by a group of people there who were interested in starting a technical university. In 1861, Rogers moved to Boston and founded the Massachusetts Institute of Technology. Interesting connections you run into while highpointing! As is evident from the shot of the three of us, and from the view the opposite way from the summit boulder, there isn't a panoramic view of the surrounding countryside from the summit, proper. 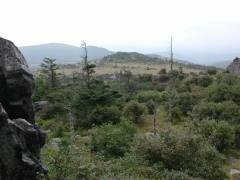 However, the views from the trail along the way more than make up for the dense cover which blankets the top of Mt. Rogers. "Country roads, take me home to the place I belong, West Virginia..." With apologies to the late John Denver, we headed northeast out of Radford and then cut back northwest, leaving the interstate at Harrisonburg and driving through the thriving metropolis of Judy Gap, WV. We found the Spruce Knob Road about a mile north of Judy Gap with no problem, but were then stopped by "Road Closed" and "Blasting Zone" signs. Arrrrgh!! To come so close and not be able to make it to the high point??? Not to worry. A short conversation with the construction workers and they told us about an alternate route, another road heading west about a mile north of where we were. Well, it was more like two miles, and a stop at the local post office to inquire again. The alternate route took us just beyond the construction closure and put us back on the Spruce Knob Road, albeit in "under-construction" condition with just the rough gravel underlayment down and not yet repaved. Once we got to the summit parking lot with this sign announcing the high point and indicating the path to the observation tower, we were greeted with more bad news. 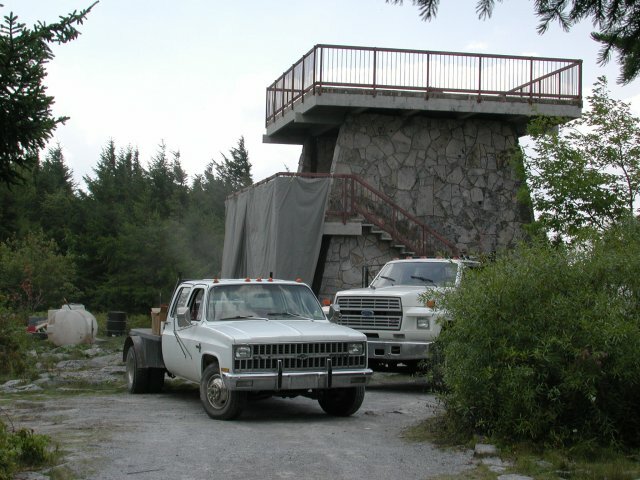 While they have the road closed, they are also working on the observation tower (sandblasting and cleaning the stonework, from the looks of it), so we had to take our summit photos from a few yards away while watching the workmen in protective gear do whatever it was they were doing to the stone tower. On the way back to the car, Marcia pointed out this interesting plant. It almost looked like an already-decorated Christmas tree, in miniature, with the flowers at the end of each branch. What is it? Well, you'll have to find someone much more schooled in West Virginia wildflowers to tell you. 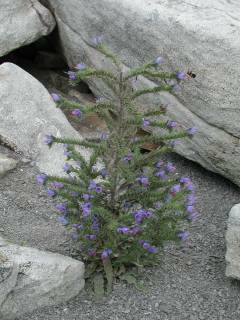 It is about a foot tall and seems to like the rocky soil on top of Spruce Knob. At any rate, we took our summit photos at the yellow tape marking the beginning of the work zone, noting the GPS coordinates of 38deg 41.997' N, 79deg 31.978' W.
We returned to the West Virginia highways, leaving the highpoint behind us, and turned north once again toward the West Virginia/Maryland line, seeking Backbone Mountain, the Maryland highpoint. In due time, we arrived at the old logging road which forms the trailhead, at 38deg 41.728' N, 79deg 29.483' W. In the not-too-distant past, finding the highpoint marker on Backbone Mountain required bushwhacking through the last half-mile of heavy brush, but the "Friends of the Maryland Highpoint", affiliated with the Highpointers Club, have improved the trail and it is now an easy walk all the way to the top. Not far from the road, we spotted this young buck on the trail. The cover was dense enough that my camera thought it needed to flash, hence the buck's bright eyes. 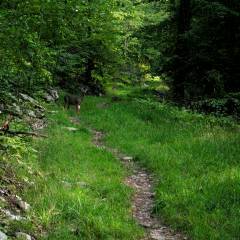 A few yards farther up the trail, a doe and two fawns hopped across the logging road and down into the brush. About 100 yards from the Maryland highpoint, the trail crosses over the West Virginia/Maryland border. There is a branch of the trail which takes you past this stone marker on the state line, and another which avoids the little bit of rock-hopping that is necessary to traverse the outcropping on which the marker is mounted. When we arrived at the summit of Backbone Mountain, referred to as the Hoye Crest, we found the marker at 39deg 14.250' N, 79deg 29.131' W with a summit log and a picnic table. 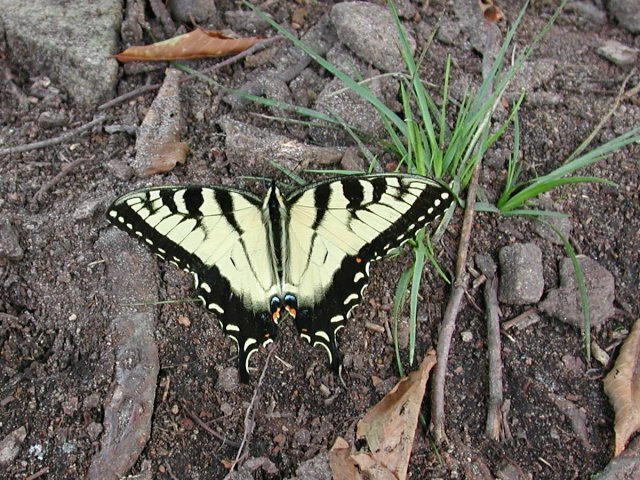 Underneath the picnic table was this exquisite tiger swallowtail which looked like it had just emerged from its cocoon and was still drying and firming its wings. Another highpointer happened along as I was setting up to take our summit photo, and we swapped photographic duties. 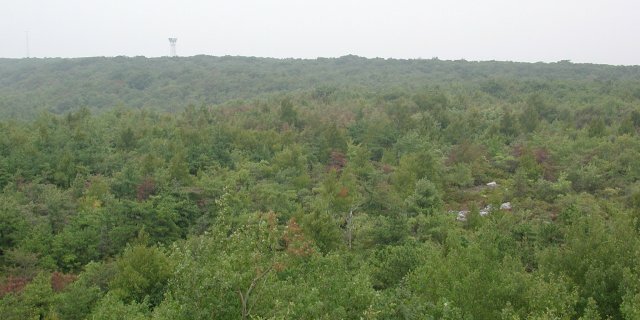 The view to the west of the highpoint is blocked by brush, but the view to the east, below, is open, thanks to some judicious clearing on that side of the mountain. Because of the haze that afternoon, only the nearest ridge was even dimly visible, but the view would be better on a clearer day. We walked back to the car and drove up to Grantsville, Maryland, for the night. Mt. 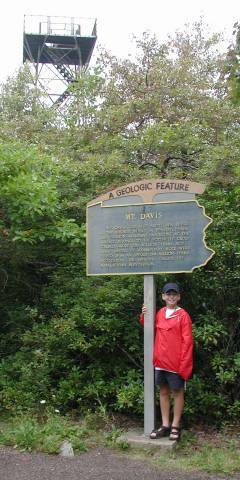 Davis, the Pennsylvania highpoint, is a drive-up, with a park surrounding it. 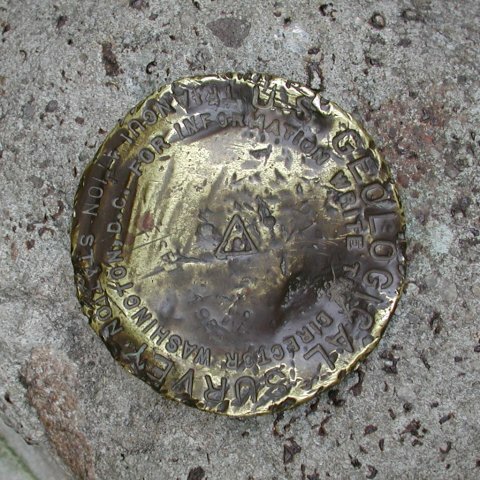 We followed the paved paths over to the observation tower and a rather beat-up USGS benchmark embedded in the summit boulder at 39deg 47.157' N, 79deg 10.623' W. Being a drive-up, even Marcia got into the act and increased her highpoint total. 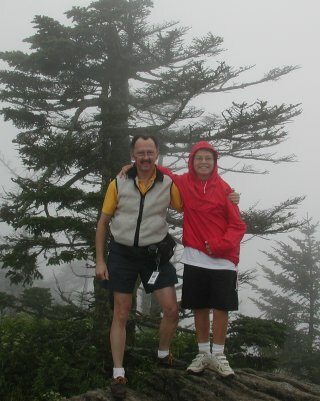 It began to drizzle as Nathan and I walked up to the top of the tower. 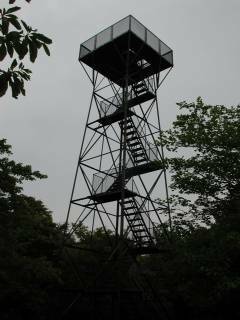 Fortunately, there was no sign of thunderstorm activity, or we would have avoided standing on what is obviously a great lightning rod, a metal tower at the top of the highest point of land in the whole state! The plaque identifying the area as Pennsylvania's highpoint also provides a bit of geologic history. Down another path, there is an outdoor exhibit area which further details the geology of the area, as well as describing the settlement and development of the surrounding area. 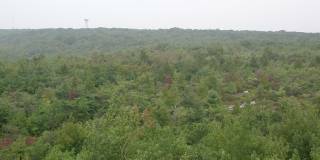 The view from the top of the observation tower is typically woodsy, with only the occasional microwave relay tower to punctuate the horizon. Leaving Mt. Davis behind, we drove eastward to Gettysburg, touring the Civil War battlefield and watching the "electric map" presentation in the visitors center. From there, we continued to Wilmington, Delaware, for the night. Tower Hill, aka the Ebright Azimuth, at 448', is the second lowest highpoint in the U.S., after Florida's Britton Hill. 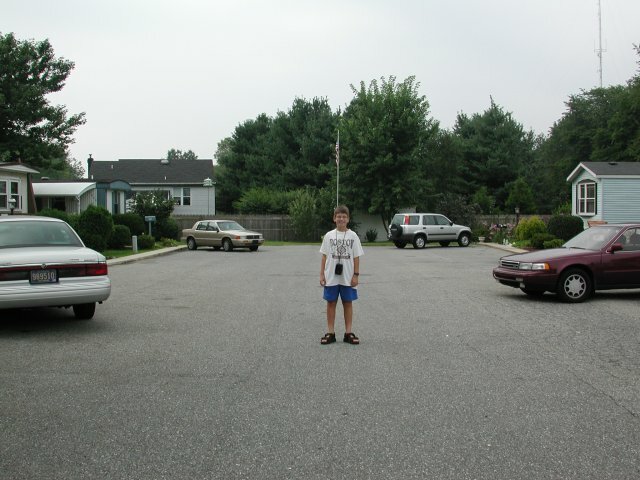 However, it is (somewhat tongue-in-cheek) often referred to as the "second most dangerous" highpoint, being in an intersection in suburban Wilmington, Delaware. 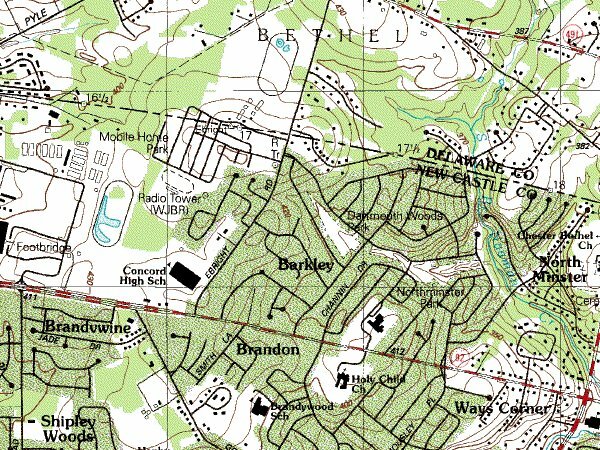 Our drive to the highpoint was only a few miles, through a typically suburban mix of commercial and light industrial development along the main road, and then a residential area to both sides of Ebright Road near the highpoint itself at 39deg 50.149' N, 75deg 31.164' W.
The sign identifying the Ebright Azimuth as the highpoint is actually across the street from the USGS benchmark. 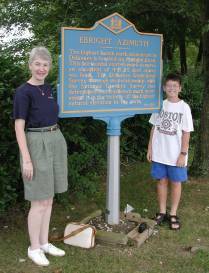 Ebright Road is a fairly busy thoroughfare, so some caution is required when visiting this most urban of the 50 state highpoints. 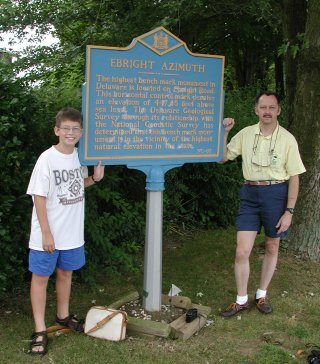 In fact, the benchmark and sign (on opposite sides of the street) may not be at the actual highpoint. Looking at the most-recent USGS topographic map, there is a closed 450' contour in the mobile home park about 100 yards west of the benchmark. The debate is whether the 450' contour is the result of grading and landscaping, or whether it is a natural feature. Time will tell. The surrounding four photos might collectively be subtitled, "Will the real Delaware highpoint please stand up?" 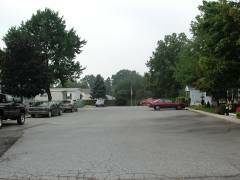 As you walk into the trailer park, there is a gradual but perceptible rise to the street. 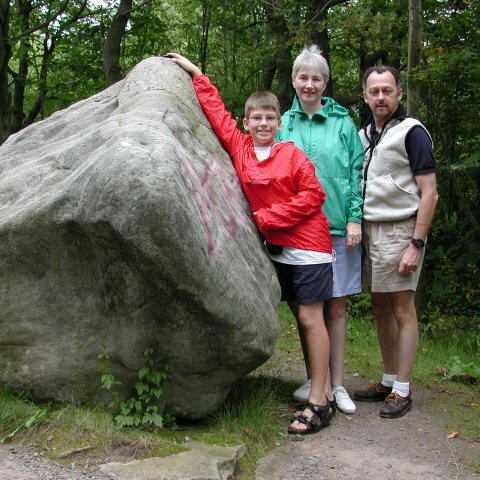 It has been rumored that the boulder where Nathan is standing is at 451', but this is probably an imported rock, and so isn't the natural highpoint. Looking south along the cross-streets within the trailer park, there is some rise in addition to the crowning of the streets. However, it may be that the entire 450' contour is the result of grading as the trailer park was created, and so would not qualify as the high point in any event. Leaving the benchmark, tower and controversy behind us, we once again pointed the Saab westward. 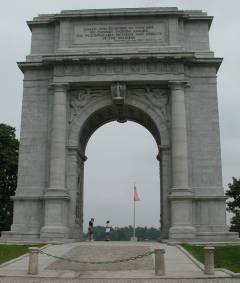 Our first stop on the way back to St. Louis was Valley Forge. From there, we continued west through Pennsylvania. Homeward bound, seven new highpoints "in the bag." We took our time, spending part of Friday at the NFL Hall of Fame in Canton, OH, and most of Saturday at the Air Force Museum in Dayton, OH. The Air Force Museum has an unmatched collection of aircraft from the beginnings of flight up to the present. Anyone who is any sort of aircraft buff could easily spend a couple of days there. Arriving home about mid-afternoon on Sunday, the trip totalled almost exactly 3,000 miles. 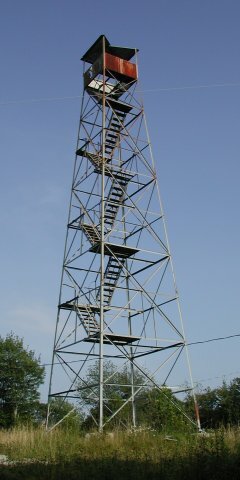 The fire tower has obviously seen better days and is missing most of its floor and one of its roof panels. The lower flights of stairs have been removed to prevent anyone from climbing it in its deteriorated state. About a quarter-mile from the high point, along the approach road, is this impressive FAA long-range radar facility. 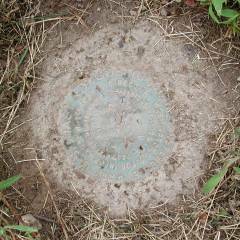 This benchmark is located under the abandoned and decrepit fire lookout tower atop Black Mountain. Mt. 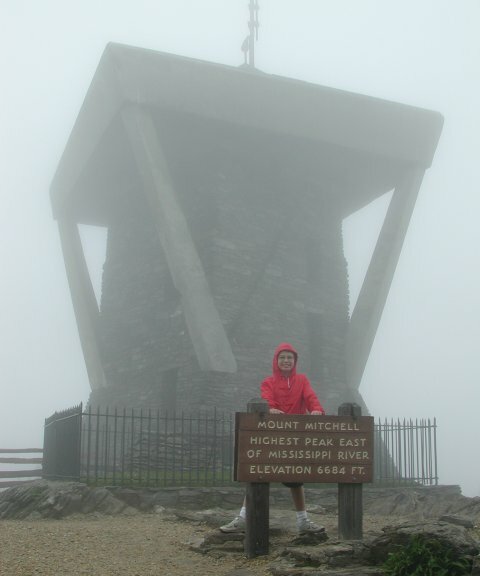 Mitchell is topped by an impressive stone observation tower which would command a dramatic view of the surrounding area on a clear day. The high point is marked with a sign denoting its status as the highest point east of the Mississippi. Mt. 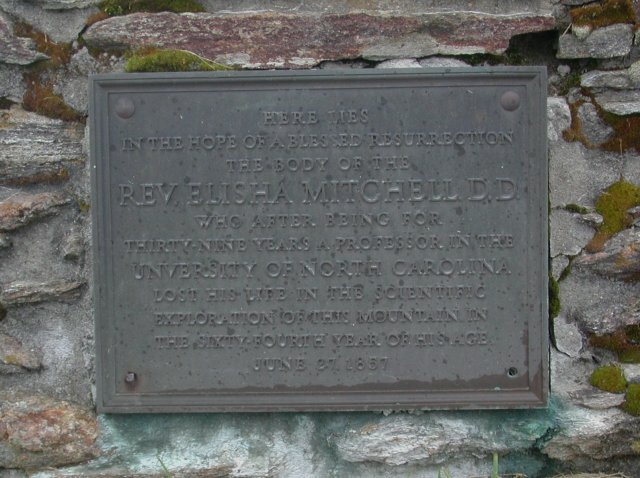 Mitchell is named after the Rev. Elisha Mitchell, who died exploring this mountain. The high point, proper, is amid a cluster of rocks on the summit, and is marked with this USGS benchmark. The state park which surrounds Mt. 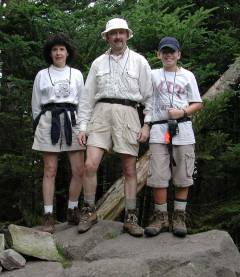 Mitchell has a number of trails and other facilities, including a gift shop near the summit and a restaurant a short distance down the road toward the Blue Ridge Parkway. Our visit coincided nicely with lunch time, so we ate at the park restaurant, where we spotted these spider webs hanging from the overhang above the windows. 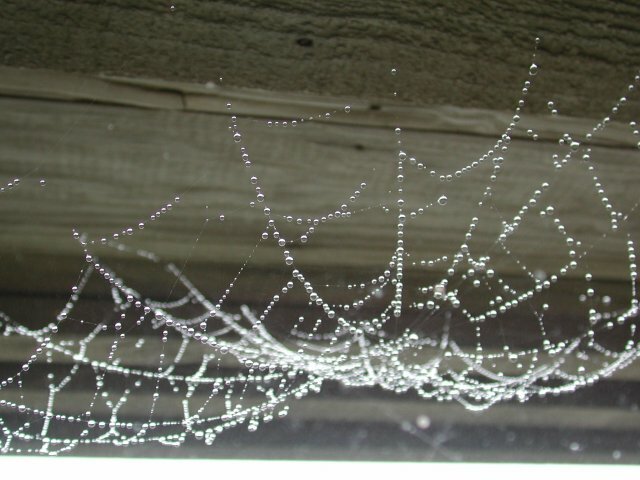 Cloud droplets had coalesced onto the spider webs, creating a jeweled appearance. 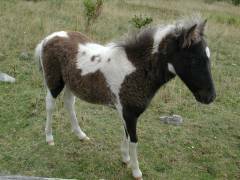 One of the friendly Wilburn Ridge wild ponies near the Massie Gap trailhead. Looking back down the trail from one of the ridges you cross on the way up to Mt. Rogers. The vistas from along the trail are expansive, with a mixture of rocks, rhododendrons, and evergreens. This would certainly be a colorful hike in the springtime. 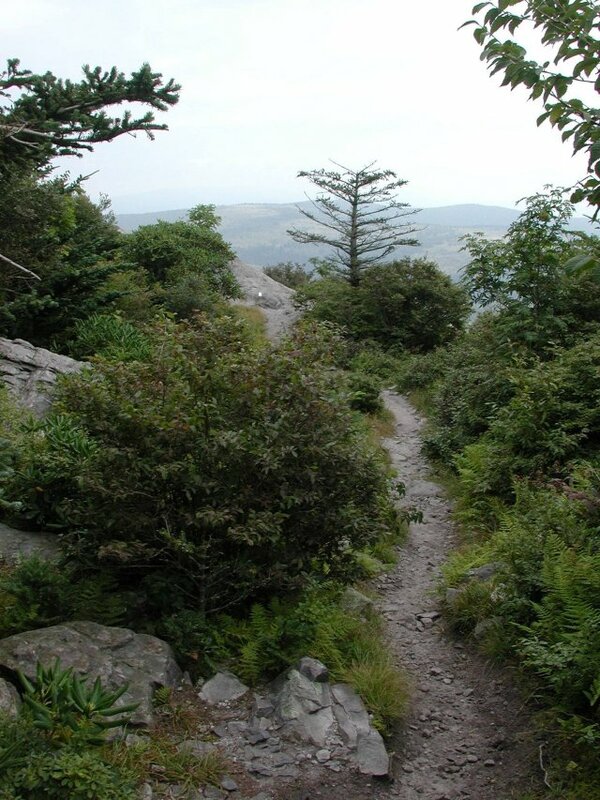 Part of the trail uses the Appalachian Trail. 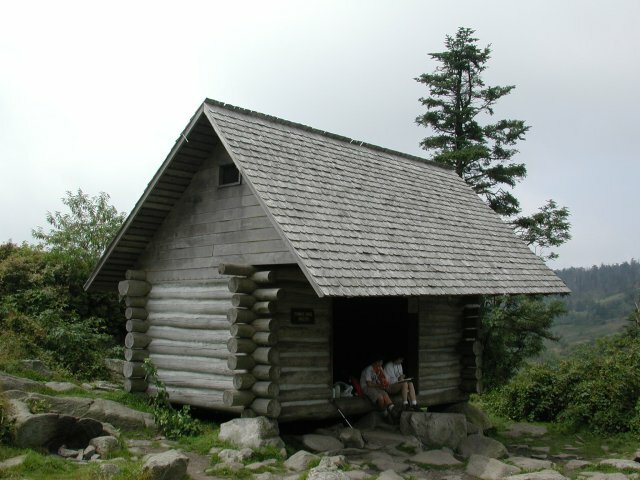 This shelter along the AT is about a mile from the summit of Mt. Rogers and makes a perfect spot to stop for lunch. The group of happy highpointers atop Mt. Rogers. The USGS benchmark is visible set into the rocks at the lower right corner of this image. 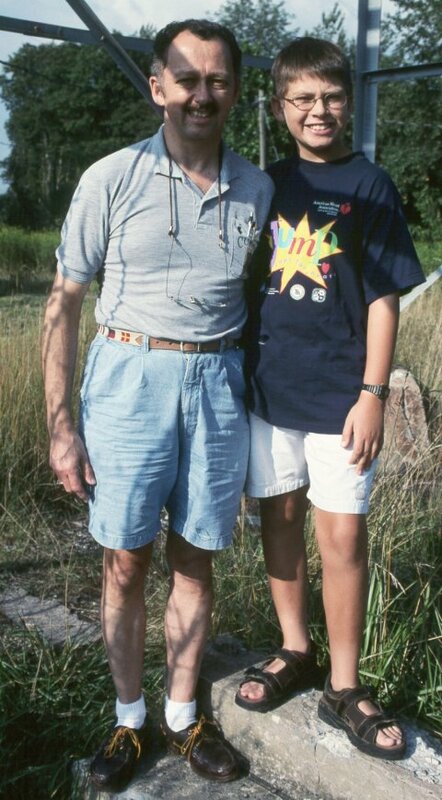 Nathan's MIT T-shirt is appropriate because William Barton Rogers, after whom Mt. Rogers was named, founded the Massachusetts Institute of Technology in 1861. 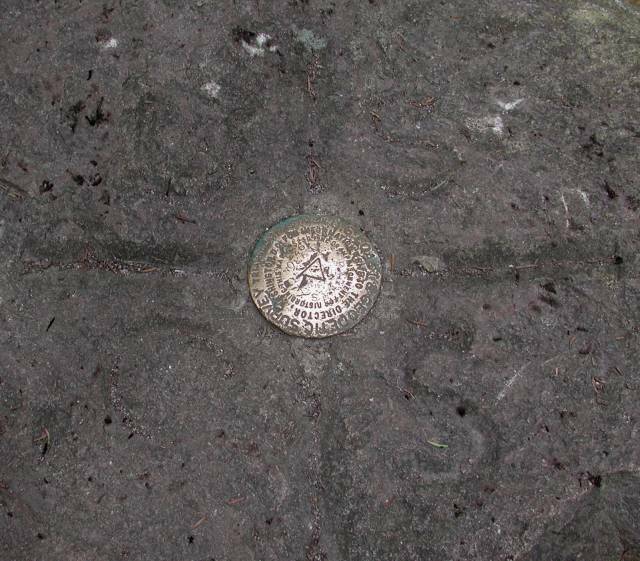 Barely visible in this shot is the faint engraving of "USGS" in the rock surrounding the benchmark. Although the views from the trail leading up to Mt. Rogers are expansive, the view from the summit is merely brushy. The West Virginia highpoint is well developed, with a good gravel parking lot, latrines, and signs pointing you to the path to the highpoint and its stone observation tower. The day we were there, the tower was being sandblasted and cleaned up, so the path was blocked a few yards short of the base of the tower. After the obligatory summit photo, we found the interesting wildflower below. Almost looks like a miniature Christmas tree, doesn't it? 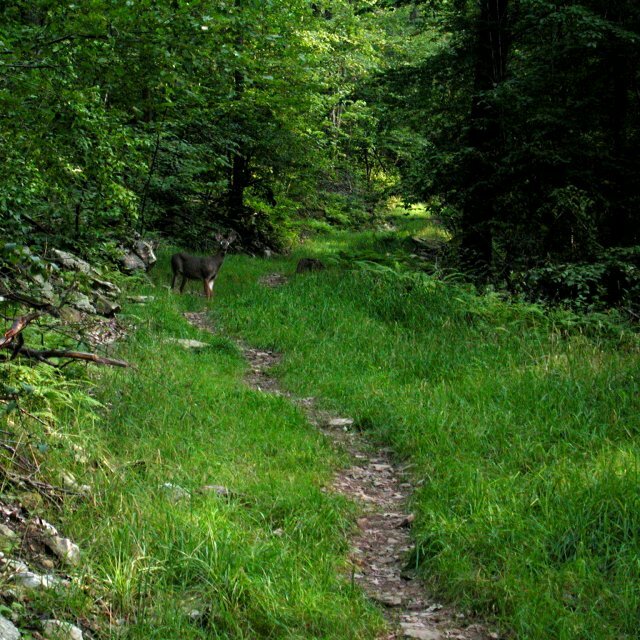 The trail up to the Hoye Crest of Backbone Mountain is well maintained and home to wildlife. This buck, a doe, and two fawns darted off into the woods as we approached. 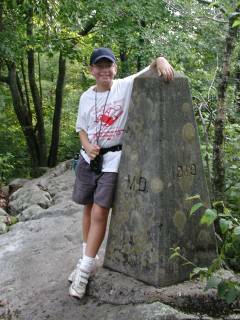 Nathan posed alternately on the Maryland and West Virginia sides of the state line, marked by this stone obelisk only about 100 yards from the Maryland highpoint. 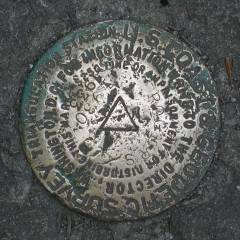 The trail divides and gives hikers the option of seeing this marker and scrambling over some rocky outcrops, or taking the "low road" and walking along a smoother trail to the highpoint, proper. 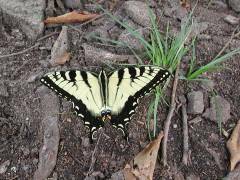 We found this butterfly, fresh out of the cocoon, under the picnic table at the highpoint. 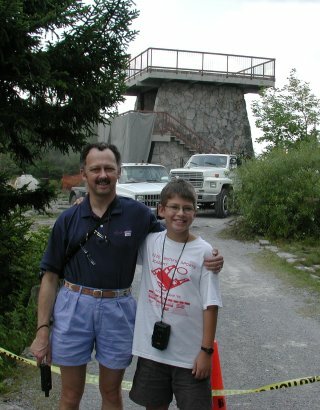 After signing the summit log, which is kept in the mailbox on the highpoint marker post, we prevailed upon another highpointer to take our photo. The panoramic photo below links to a VR "movie" of the panorama. It covers only about 120 degrees, the scope of the clearing, but provides more detail than is visible in the single photo. Controls for the VR movie are: Shift zooms in. Ctrl zooms out. Holding the left mouse button and moving right, left, up, or down will pan the viewing window in that direction. Because of the vagueries of VR movies, the 120 degree panorama is joined into a full cylinder, so you can spin all the way around even though the original image is not a full 360 degrees. The file is about 140k, so base your interest on your patience downloading files of that size. 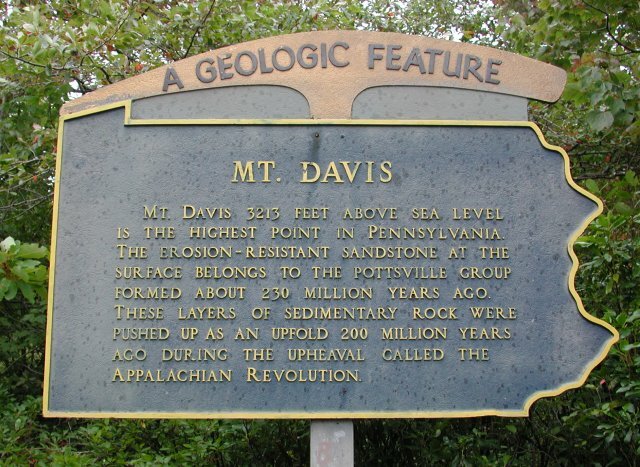 The plaque documenting Mt. 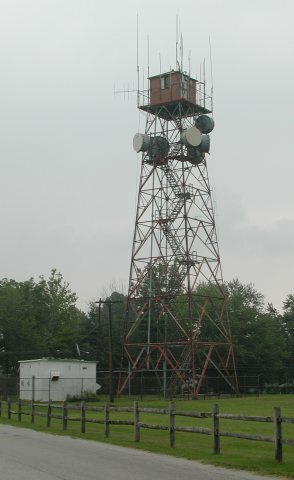 Davis as Pennsylvania's highpoint is a few yards from the benchmark and the observation tower, which is visible above the trees in the background. Nathan and I climbed the tower in the drizzle and stayed just long enough to take one photo illustrating the woodsy view from the top. The USGS benchmark atop the summit boulder has obviously been considerably abused over the years, but it is still securely attached to the rock. Tower Hill takes its name from this tower. It would appear that it might once have been a fire lookout tower, but it now fairly bristles with microwave relay and cellular telephone antennae. 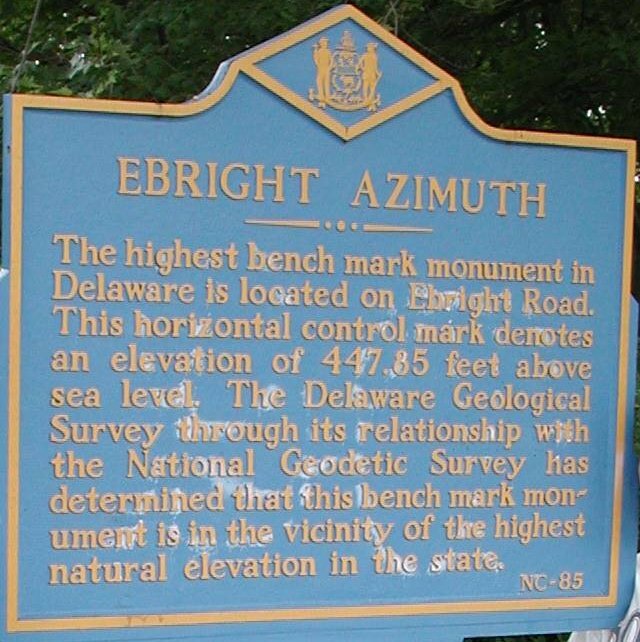 The plaque across Ebright Road from the USGS benchmark is a bit vague, noting only that the "Ebright Azimuth" is in the vicinity of the highest point in Delaware. The benchmark is set between the curb and the sidewalk, and is actually about six inches below current ground level. It takes a bit of careful scouting to find it, especially if the grass hasn't been cut lately. On a snowy day, you would need a metal detector and a shovel to uncover it! 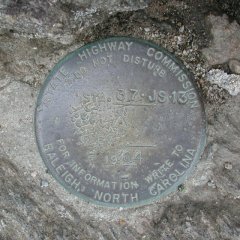 Our "summit photos" were taken at the plaque, across the street from the benchmark. Now for the controversy! 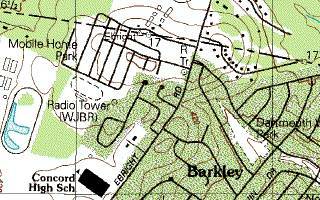 Look at the topo map fragment below. 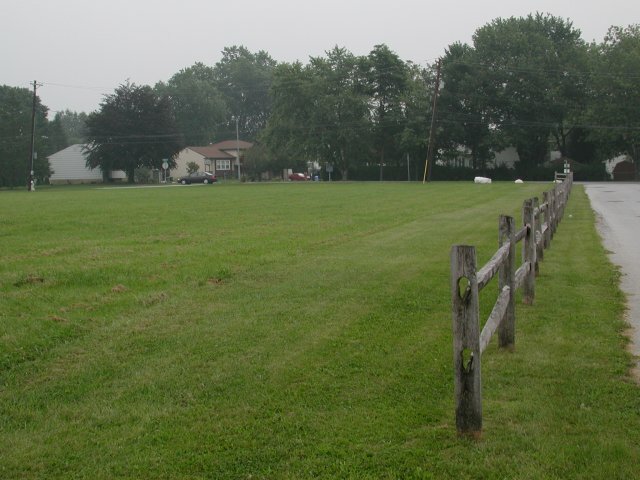 As you look at the area marked "Mobile Home Park" to the northwest of Ebright Road, you will see an oval heavy contour line to the south of the main street into the park, which crosses the second and third side streets off to the left of the main road. If you now look closely at the other surrounding contours, you will note that there is a 10-foot contour interval, and that the previous heavy contour "downhill" is at 400 feet. 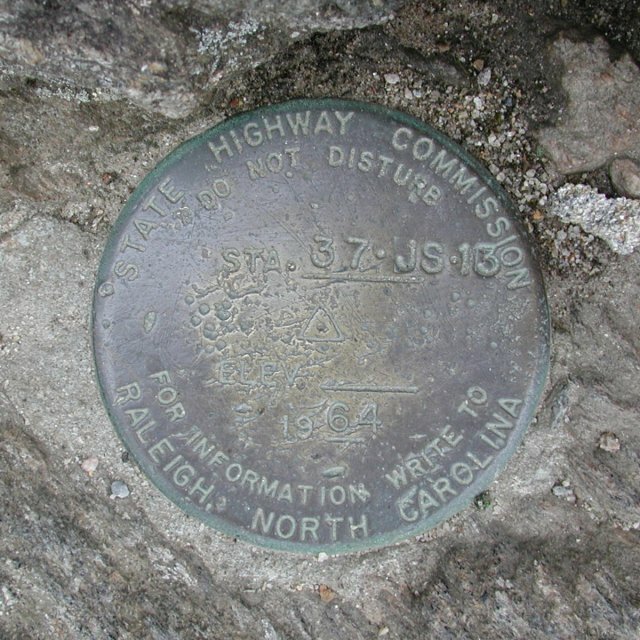 That means that the next contour is 450 feet, or two feet higher than the published altitude of the Delaware highpoint (448'). Very interesting! A visual inspection shows a very gentle uphill trend from Ebright Road as you go along the road into the mobile home park, and it appears that the side streets also go uphill a bit as they leave the main road. The ultimate question is, of course, "is that 450-foot contour natural or manmade?" 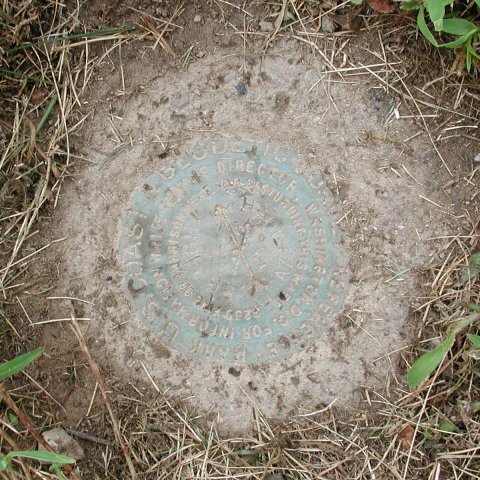 If it is natural, then the USGS benchmark is not at the official highpoint of the state, but is merely a convenient nearby marker. If the entire area has been graded and landscaped in the process of clearing it and creating the mobile home park and streets, the 450-foot contour may be entirely man-made and thus does not exceed the natural elevation of the point marked by the benchmark. Perhaps the Highpointers Club could get permission to do some soil cores throughout the area and attempt to determine if the 450-foot contour is natural or man-made, and settle the issue. 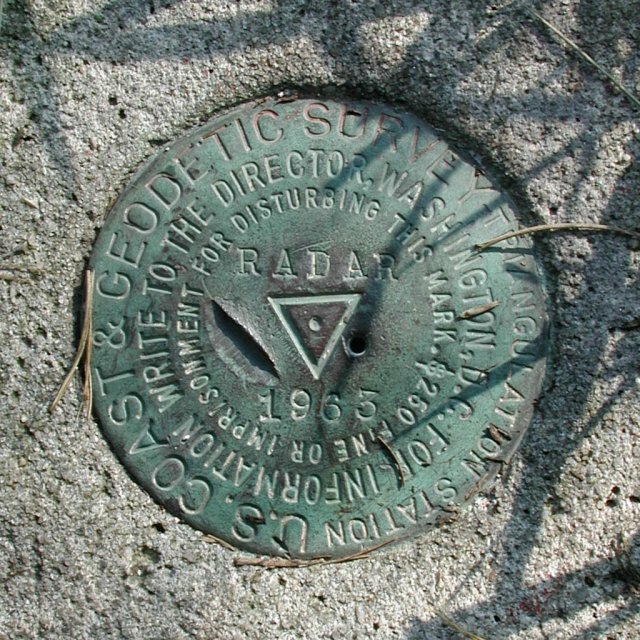 Or, the USGS benchmark may remain the "traditional" highpoint and continue to be recognized by the club as the official goal for highpointers. Anyone wishing to cover all their bases is certainly capable of reaching any and all of the "high ground" with a casual stroll along the mobile home park streets. 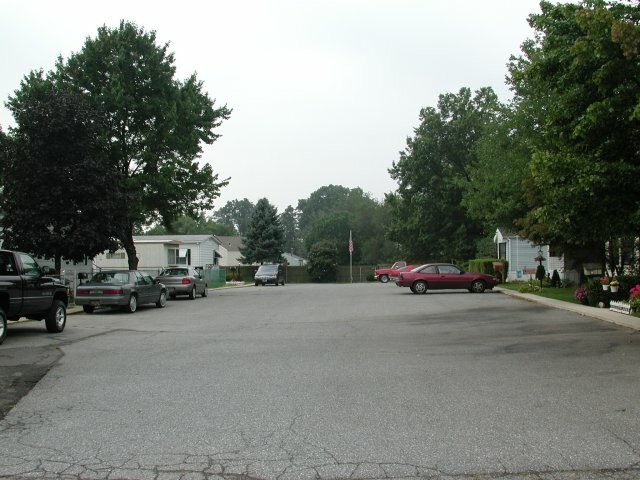 The other views below show the rise along the main street into the mobile home park, and the view from the "main drag" into two of the side streets. Proof of which point in any of these is actually the highest is left as an exercise for the reader.